The drive to Salinas from San Jose took only an hour and the only hint of ‘range anxiety” came when we were 21 miles away, and our meter said we had only 19 miles of charge. Luckily, my husband has been driving a 2012 Nissan Leaf since January, and so we both knew that driving uphill as we were at that moment can make it appear that we have fewer miles of juice than you do. The “low battery” charge warning started beeping when we pulled into town. Thanks to the Plugshare App, we quickly found a vacant charger among the several chargers in town. The app shows you chargers near your location, and then allows you to get directions to the charger with a click of the button. The last 50 feet is usually the trickiest part because you have to spot the small silver and black chargers, which are not always obvious. 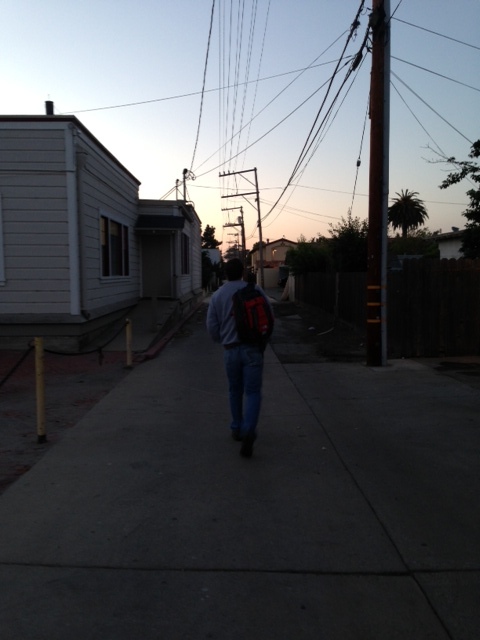 We picked one on Pajaro Street. After plugging in the car, the real fun began. We realized that we had no place to go and nothing to bring us there. Within a few minutes, my husband’s Nissan Leaf app would tell us how many hours of charging it would take to bring the car up to a full charge for the morning. What would we do in meantime? A cold wind was blowing through the quiet streets of John Steinbeck’s hometown as the sun started to set. We had nowhere to go in an unfamiliar town. I dug through the back seat, happy to realize that I did remember to bring my fleece jacket, slipped it on, put on a comfortable pair of Tom’s walking shoes and we headed downtown. I had made no advance hotel reservations because the Yelp reviews included some questionable comments about some of the accommodations within walking distance so I wanted to see them first. After walking almost a mile (0.7) we found the Monterey Coast Brewing Co., and went in for dinner. There, in the warmth of the brick-walled cafe, we spread our smartphones and other devices on the wooden table, ordered some dinner, and realized that our work had just begun. Noticing that my iPhone was losing charge, I powered it down, realizing that we needed its GPS to find wherever we were going to end up for the night. That was one battery which could not run out. I pulled out my iPad instead. Connected devices are crucial if you are going to drive an electric vehicle. In between bites of salad, I searched for nearby accommodations. Some were two miles away, others were more than a mile. 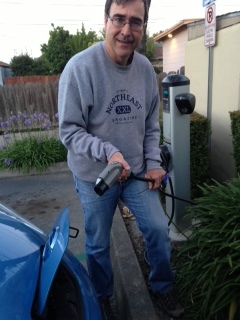 Our plan was to drive to a motel, check in, drive the car back to the charger, and let it finish charging, then, walk back to the motel, and then, walk back to the charger to retrieve the car when it was finished charging. My husband then delivered the bad news. The charging, according to the app, would take four more hours to finish. It was 9 p.m., and the cafe was closing at 10, and still, we had no place to stay. Perhaps we could go to a movie next door, and by then, the car would be charged, and we could drive to any motel we wanted. But that would mean walking through the vacant streets after midnight. Finally, we asked the waiter if there was a place to stay nearby. The first one he mentioned I had read about. A review said it was for “desperate travelers” and yes, he said, they lock you in after 10 p.m. Perhaps we might try another motel about a mile away, he suggested. We ordered big, fattening desserts and mulled over our options (or lack thereof).Our plan to not leave the car out charging all night no longer seemed practical. Therefore, if we were going to stay in the nicer hotels outside of downtown, we would need a taxi, and wasn’t that defeating the purpose of going gas-less? Our roundtrip will exceed 700 miles, and it is a great feeling to know that we will not spend a penny on gasoline. In the end, we paid our bill, headed back to the car, grabbed our luggage and walked another 0.3 miles to the motel he recommended, a basic Howard Johnson Hotel. The man who checked us in gave us complimentary bottles of water. His night was over. He had sold us the very last room. Follow us on Twitter @survivingevlife and @deborapetersen.